2012 has gotten off to a great start. Very busy, though. Have you gotten a chance to check out the new website? It’s www.typewriterpoetry.com 🙂 I wish I knew how to merge these two blogs together, so that all of you can comment directly through your WordPress accounts. Alas! The internet. I’m currently rewriting archived Typewriter Poetry poems. I’m planning on creating a bunch of handmade chapbooks (30 poems in one book)…would be fun to give out to friends and possibly sell. 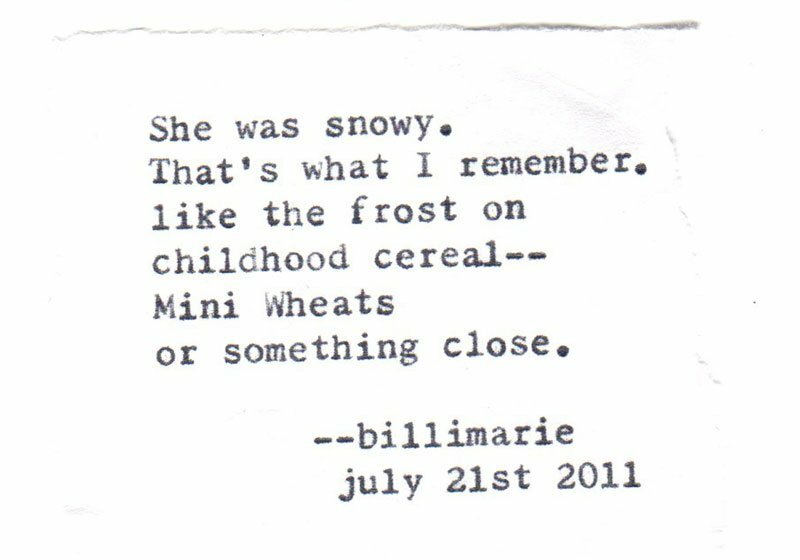 If you could let me know which Typewriter Poetry poems were your favorites, that would be a big help! I love the old typewriter-style font :). I think this is great! Please go to the link to claim the award.